The Janome Compulock Serger 888 is the only serger with an interactive touch screen display that helps you select the right stitch. The large interactive Visual Touch Screen, unique to Janome, displays information to help you select stitches, and it registers your input when you are choosing a stitch. Get Creative with Your Serging! The Compulock recommends settings, changes settings and receives messages, using many of the same screen navigation keys that are found on the popular Janome Memory Craft sewing machine. Another nice feature is the large work space on the Compulock. It offers nearly three times the work space found on other sergers—to the right of the needle. The 888 is well-built and sturdy. It is relatively quiet for a serger. The Janome Compulock Serger 888 is intuitive – easy to learn to use. On the Janome Compulock Serger 888, you must change the needleplate in order to convert to a cover stitch. Many reviewers found this to be cumbersome, while others considered it to be a minor annoyance. The Pfaff serger, on the other hand, only requires that you flip a small lever (in addition to correct threading and needle positions). Even though you can adjust the tension on the Janome Compulock Serger 888, most reviewers reported that they didn’t usually find a need to adjust it. LCD lights to help you see when threading the serger. Safety system – Five sensors monitor your machine settings to remind you of any oversights which might ordinarily lead to problems. A “beep” initiated by any one of these sensors will be followed by a message on the touch screen. And, the Compulock won’t run until you take the appropriate action.These sensors indicate when a door or looper cover is ajar, when the knife or the upper looper is in the wrong position, when the presser foot is up or when the wrong needle plate is in place. This feature helps beginners feel at ease with the serger and with serging, which can be intimidating. With the Janome Compulock serger 888, it’s extra important to clean the machine regularly. The sensors mentioned above will malfunction if they get too dusty. By the way, this would be true for any computerized serger. Make Quick & Easy Serger Projects! While most 888 owners love their Janome sergers, a number of dealers have warned that the Janome Compulock Serger 888 has had its problems. It seems that, if something does go wrong, this particular Janome serger is difficult to fix because of the complex mechanisms. If this last point is important to you…you might want to look into the Janome CoverPro 1000cp. The 1000cp is a combination of an industrial-style cover hem machine and a convenient home machine. The marriage of the two has produced a high-speed, long arm, heavy-duty cover hem machine that looks and operates like a sewing machine. 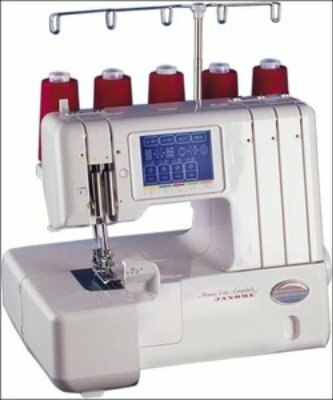 The Janome Compulock Serger 888 is no longer available on Amazon. You may be able to pick one up on Ebay. The Janome Compulock 888, 5 Thread Serger, retails for $2399, but you should be able to find one for around $1000.